Not far from the Bon Marché in the 7th arrondissement is a short dead-end street that terminates in a quiet space enclosed by the surrounding buildings, with trees, paths, and some flowerbeds: the Square Récamier. Récamier. When we first entered this sunken garden, all the name meant to me was a painting in the Louvre of an attractive woman posed on an elegant sofa. The sofa and the woman had the same name, and that was the sum total of my knowledge about Madame Récamier. I don’t think I’m alone. 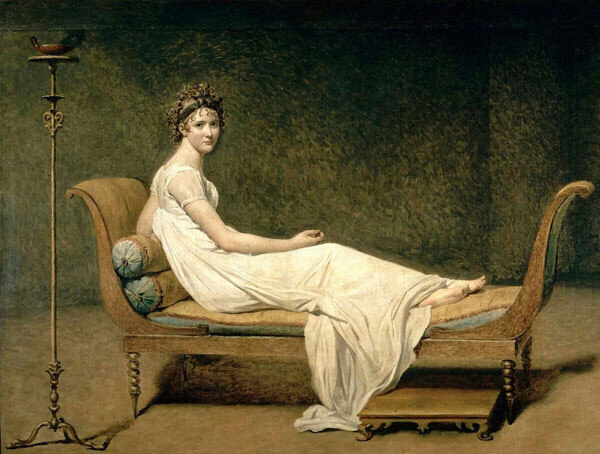 When most people hear the name “Récamier,” that’s all they think of – some famous painter depicted her, she was very pretty, she wore Grecian-inspired garments typical of the early 1800s, and she lounged around on sofas. End of story. The lady is not a sofa. Indeed, she had an extraordinary life, and I’m amazed there are no recent biographies of her. The museum in her birthplace, Lyon, presented an exposition in 2009 that collected some of the most famous artifacts associated with her (including the inevitable sofa), but otherwise, she seems to have slipped into obscurity. It’s not that she led an uninteresting life. She was sufficiently interesting for Napoleon to banish her, and he banished people because they threatened him. So she wasn’t a cupcake. I feel she should be better known. And so, with apologies to Jean-Luc Godard, I present Deux ou trois choses que je sais d’elle (Two or three things that I know about her). Thing 1: Juliette Récamier (née Bernard) married a 42-year-old man, who may well have been her biological father, when she was 15 years old. Her husband, Jacques-Rose Récamier, was certainly a very, very close friend of the family, particularly of her mother, and the speculation was inevitable. But why would he do this? There is a reason, if a strange one. Juliette married in April 1793 in Paris, at the height of the Terror. Every day, aristocrats were being guillotined. If Jacques-Rose Récamier was indeed her natural father, there was method in his madness. Apparently, he fully expected to die in the Terror. He was even in the habit of attending the executions each day in order to steel himself for the time when he himself would have to mount the scaffold. He may have thought that marrying his daughter would be a way to preserve his fortune and pass it on to her. If so, the plan backfired. He wasn’t executed. The Terror ended, and there he was, married to a teenager (who at that point was still living with her parents). A quandary if there ever was one. Oddly, though, the marriage endured. He lost all his money, and they stayed married. She fell in love with someone else, and they stayed married (although this episode brought her close to suicide). They didn’t live together much, but they never divorced. There is a story there. Thing 2: She maintained a salon and was banished from Paris for doing so. Her salon is what drove Napoleon nuts. She entertained, and the people she entertained expressed disapproval when Napoleon made himself Emperor. From Napoleon’s perspective, this was not to be tolerated. Juliette Récamier was not possessed of a razor-sharp wit, nor was she one of those women who manoeuvre politically behind the scenes or write inflammatory books. She was beautiful, kind, and hospitable, and when she still had money, she employed a good cook. That was enough to make her a salon hostess, and her salon attracted many of Napoleon’s opponents. More importantly, Juliette was a close friend of Madame de Staël, who was a writer and a brilliant conversationalist and who persistently meddled in politics. Germaine de Staël was not a classic beauty, but she was attractive in a emotional and extremely high-maintenance way. One biographer neatly summed up one typical episode as “Scenes. Screams.”* Madame de Staël wrote books and lobbied like mad for the causes she believed in, but she also kept falling in love with the wrong men and suffering agonies when things fell apart. Juliette Récamier and Germaine de Staël were an odd couple, but Juliette was devoted to her friend, and when Napoleon banished Madame de Staël, Juliette had to make herself scarce as well. Thing 3: She lived much of her life in a convent. As a child, Juliette lived in the interestingly named l’Abbaye royale de la Déserte in Lyon, where her parents left her while they moved to Paris. She was apparently very happy there. Then in 1819, when Napoleon was himself exiled, her husband had lost all his money, and Germain de Stael was dead, she returned to living in a convent. This was l’Abbaye-aux-Bois in Paris, located where the Square Récamier is now. ** The nuns offered inexpensive rooms to impoverished gentlewomen, and Juliette moved in with her books and her harp and, of course, her sofa. The nuns allowed visitors, and Juliette was able to maintain her salon. In fact, the arrangement was quite pleasant, because the nuns required visitors to leave at midnight, so the hostess was not obliged to stay up too late with over-talkative types. Juliette lived in a small suite for several years, and then took a larger suite when it became available. Her friends continued to visit, but left promptly at midnight. One of them was the writer François-René de Chateaubriand. Everything I have read about him makes him sound like a tedious, self-important windbag, but Juliette was inexplicably fond of him. He was a constant presence at her evenings, and often read from his writings. People kept coming anyway. 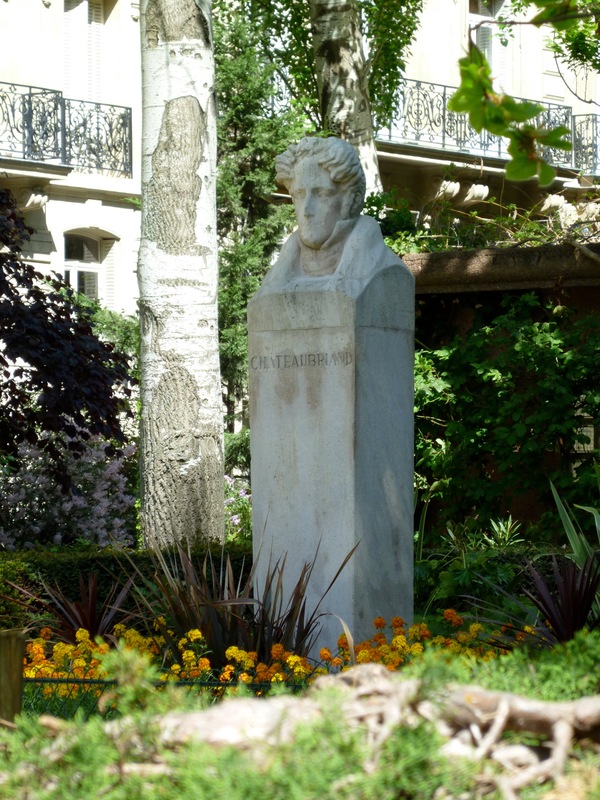 Chateaubriand haunted the area, and there is a statue of him in a nearby park. Not the Square Récamier, but not far away. Thing 4: She ended her life blind, and died of cholera. Juliette’s life was not easy. She was married before she knew what was what, and there was an impediment that made the marriage sterile (she had no children, but adopted a niece, who was devoted to her). She was temporarily banished from Paris for befriending a strong-minded writer and salon hostess. Her husband lost his money and left her penniless. She fell in love when she was about 30, but could not marry the object of her affections. When she was in her sixties, she lost her sight, but she did not tell anyone. Her servants arranged the furniture so she could move around her apartment without trouble, and she was good at recognizing voices. Many of her visitors never suspected a thing, although close friends knew the truth. She nursed her husband through his final illness in April 1830, and he spent his last days with her at the Abbaye-aux-Bois. In May 1849, Juliette Récamier died of cholera at the age of 71. Now, for most people that is probably an unremarkable fact, but it jumped out at me because several of my ancestors died of cholera later that year, when the epidemic reached Lancashire. Cholera was a horrible way to die, because the victims remained conscious and knew what was happening to them. In 1849, the origin of the disease was unknown, and so was the treatment. It was only in the 1850s that the source of the infection (tainted water) was identified – too late for Juliette, and too late for my great-great-great-grandparents. Juliette is buried in Montmartre Cemetery. Juliette Récamier (born Jeanne Françoise Julie Adélaїde Bernard in 1777) was one of those people who had their eventful lives thrust upon them. She was beautiful and by all accounts, sweet-natured. She married the man her parents told her to marry, and stayed married to him until he died. She was painted and sculpted by everyone who was anyone during her lifetime, even when she was quite elderly. She was loyal to her friends, even when she had to make sacrifices to maintain those friendships. She was so beautiful that men kept falling in love with her, but she kept these would-be suitors at arm’s length and usually ended up retaining them as long-term friends. She defied Napoleon and outlasted him. There is a lot more to her than a sofa. * Margaret Trouncer, Madame Récamier, Macdonald, 1949, p. 67. ** Although convents and monasteries were suppressed during the Revolution, many were re-established in the early 1800s. The abbey was demolished in 1907 (for photographs of what it looked like just before demolition, click here). A theatre was constructed on the site of the former church, and called the Theatre Récamier. It closed in 1976 and the space became a rehearsal hall for the Comédie-Francaise until 2008. Further reading: Good luck. The biographies in English are all quite dated: H. Noel Williams, Madame Récamier and her Friends, Harper, 1901; Edouard Herriot, Madame Récamier, William Heinemann, 1906 (2 vols. ); Margaret Trouncer, Madame Récamier, Macdonald, 1949; Maurice Levaillant, The Passionate Exiles, George Allen, 1958. The beautiful and detailed catalogue from the Lyon exhibit, Juliette Récamier: Muse et Mécène, published in 2009, is available only in French. There is more information (in French) on the museum’s website. Text by Philippa Campsie; contemporary photographs by Philippa Campsie & Norman Ball. This entry was posted in Paris history and tagged Abbaye-aux-Bois, Cholera, Francois-Rene de Chateaubriand, Germaine de Stael, Jacques-Rose Recamier, Madame de Stael, Madame Recamier, Musee des Beaux-Arts de Lyon, Napoleon, rue Recamier, Square Recamier, Theatre Recamier. Bookmark the permalink. Absolutely fascinating! Really enjoyed this post and learning more about what sounds like a very interesting woman. Yes, a very interesting post. 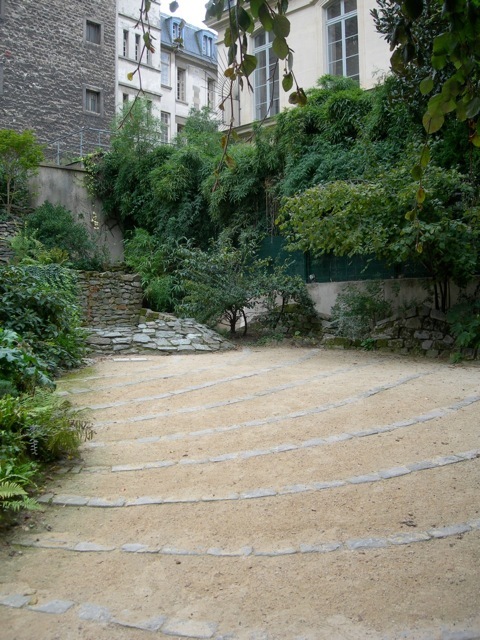 Is this the garden near the Espace Electra, the EDF owned gallery? If so, it is a very nice (and quiet!) little garden too. Yes, that’s the one. We found it just after we’d been to an exhibit in that gallery. Thank you for your post which was written beautifully and far more accurate/informative than much of the “gossip” out there. She (Juliette) looks identical to someone I’m in love with (Alice) ..especially the bust done by Joseph Chinard. The more I read about Juliette Récamier, the more I start to believe in reincarnation ;). Except in this life she will get all that she wished for in the last..(emotional, physical and eternal) =) I love you Alice! If Alice is indeed the reincarnation of Juliette Recamier, she must be both lovely and sweet-natured. It would be quite understandable that you would be in love with her. I wish you all the best in following your heart. Thank you so much for such an interesting article. There’s not much information on the web about Juliette Récamier, so I was delighted when I discovered your post. It makes me want to discover more about this interesting lady. She is fascinating. If you can get hold of even one of the books written about her that are listed at the end of the article, you will learn much more. I am surprised that nobody has written a modern biography of her.